We take a look at a song that knows more than it’s telling… This time we dip once again into the repertoire of one of the 20th century’s greatest songwriters: Hoagy Carmichael. I Get Along Without You Very Well has a nice little story attached to it -one which I’ve heard from several sources and therefore believe to be true. Apparently, Hoagy wrote the tune around a poem sent to him by a fan who had recently lost her husband. In the poem, she is saying that she misses her husband, but she’s fine and not to worry. Hoagy was so touched by the sentiment expressed in what the lady concerned had written that he set it to music and it subsequently became a big hit. The lady had never written anything before and never wrote anything subsequently. It’s a remarkable story – and it’s a remarkable song. I first came across it when I heard a version recorded by Frank Sinatra with a sumptuous string arrangement and orchestration by Nelson Riddle. As mentioned before how you can gain an awful lot of ideas for solo guitar arrangements by listening to big bands – remember Neil Hefti song? Listen to how the various instruments interact with each other and blend together; you might not have a full orchestra at your disposal, but all the basic principles of great arranging are right there for you. I Get Along Without You Very Well is not the longest title in popular music – David Mead tells that his personal favourite is There’s No Lights On the Christmas Tree, Mother – They’re Burning Big Louie Tonight but he’s a strange lad… Anyway, down to business. As mentioned before how important it is to bear in mind the lyrical content of a song while contemplating the mood of your arrangement, and this is certainly the case with this tune. As you will have already read, the lyrics in this case bear a certain irony: the title would suggest that the author is doing fine and getting by, but the underlying meaning would suggest otherwise. So the mood for this arrangement is soulful and reflective, delicate and sentimental. I’ve put together my own introduction for the tune, which I reintroduce at the end. If you recall our look at chord melody intros (Jazz Openings) you might remember that I said that an intro’s main job is to set the scene for the tune itself and to draw the listener in toward the main melody. This particular intro is a case in point: I’ve tried to ‘dress the stage’ for the main melody and create a suitable mood. The main tune of the song I Get Along Without You Very Well itself should be brought out as much as possible from the accompanying arpeggios. I’ve said this many times in the past, but it’s important that the melody is the most notable thing about the tune and this simply won’t be the case if it’s being swamped by the chords. There’s no trick to the technique of highlighting a melody within the framework of a piece – you just have to make sure that the melody receives greater emphasis. You can do this by just being that little more heavy-handed with the fingers you choose to play the tune with -that’s all there is to it. It’s a thing all classical guitar players have to learn to do, so you’re not alone by any means! It might be worth saying a few words about the timing of this piece. When I play, I tend to let the timing of the piece remain very ‘free’ – that is to say that it’s not a strict four to the bar. When we transcribe the tunes, we have to write it in such a way that it ‘fits’ rhythmically speaking and so, in a way, you could say that what you see on paper isn’t quite what you get on the audio track. I believe that a ‘freeform’ approach sounds better and lets the music create its own space. It’s more dramatic, too, in the way that it allows you to stretch things – the music rises and falls naturally. But things have to remain coherent and so it’s better to use the transcription as a guide rhythmically and then use your own creativity to let it flow as you see fit. 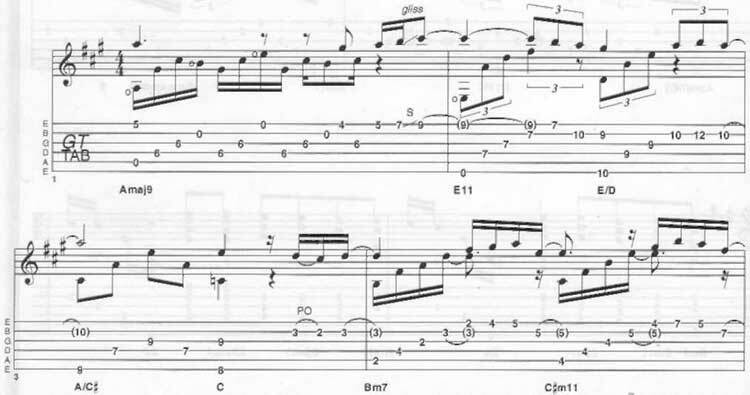 Next time, we’re going to look at one of the most popular chord arrangements in jazz and examine various ways of developing a solo to go over the top. Without You Very Well music sheet and guitar tab. © 2012 - 2019 TabsClub Powered by TabsClub 42 queries in 0.300 seconds.